5G variants of Xiaomi Mi Mix 3 can be launched soon - mobilereview.online - The Ultimate resource for mobile phones reviews, specification, information. China's mobile maker Xiaomi launched Mi Mix 3 smartphone in October this year. During the launch event, the company had confirmed that the 5G variants of Shaomi Mi Mix 3 will be dropped in 2019. Now Xiaomi President Lin Bin recently shared a picture. 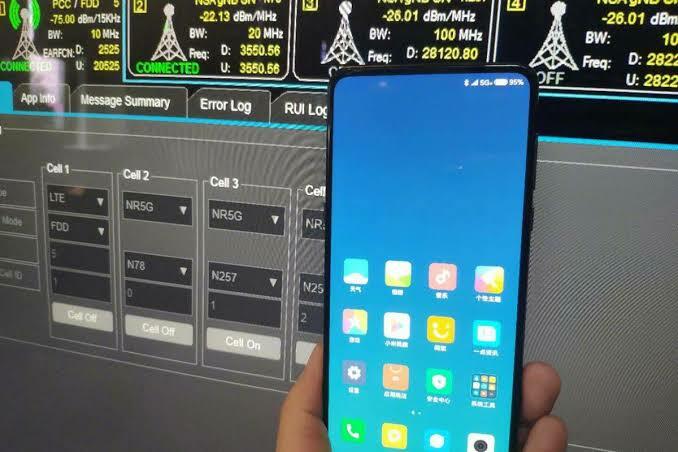 The Mi Mix 3 smartphone in the picture is showing up on the 5G network. Talking about the main feature of Mi Mix 3, this handset has magnetic sliding front camera, dual vertical camera setup, two selfie cameras on the front panel and a nozzled bezel-less display. Shaomi President Lin Bin shared the picture on Chinese website Weibo. This is a sign that the 5G variants of Mi Mix 3 can be launched soon. In the picture, the top 5g and the left side of the Android pie logo will appear. Remember, during the mix 3 launch event, the company had said that the 5G variants of Xiaomi Mi Mix 3 will be lowered for the European market in 2019. Apart from the photograph, no other information related to the smartphone has been disclosed. The Mi Mix 3 5G variant's design and specifications will be similar to existing Mi Mix 3. For security, the fingerprint sensor on the back panel, 3,850 mAh battery, for lifting phones with 6.4 inch (1080x2340 pixels) Full HD + Olead panel, 10 GB RAM, Snapdragon 845 processor, dual rear and front camera. In addition to Xiaomi, OnePlus has also confirmed that the company will take a look at the 5G variant next year. It is expected that next year Mobile World Congress can launch OnePlus 5G device in 2019 (MWC 2019).